The Domino's Pizza Card Fundraiser is here! We have helped over 25,000 schools, churches, youth groups, sports teams, fraternities, and countless other types of organizations raise over 50 million dollars with our unique fundraising programs! 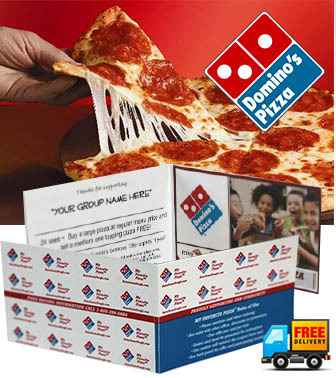 Our highly profitable fundraising products like the Domino's Pizza Card Fundraiser can help your group earn thousands of dollars this year. Are you tired of the same old fundraisers that only offer 30-50% profit? You need to try the Pizza Card Fundraiser! If you've ever considered fundraising with a pizza card, now is the best time to start your fundraiser! Credit card sized to easily fit in a wallet! Offer good at participating locations only. OurGV.Org consistently finds ways to create win win relationships between non-profit organizations and their donors. We help organizations to raise more money without them even having to ask for it!